In a post of mine earlier this year, I wondered what was pan-Indian about the “Indian cuisine” given the variety across the states, and indeed within a state as well. Havingdeeply reflected for several months I have realized that the two things most common- and loved- are achaar and chutney. For most of us no meal is complete without these. The source vegetable or fruit for either could vary, the preparation method could differ, they could be wet or dry, but their place on the Indian dining table remains constant. Setting off on a longish train journey? In the days I was growing up you never knew how long a train journey would take, a fourteen-hour trip could take up to twenty four hours or even thirty four. So advance precautions were in order. The housewife would pack some achaar along with poori. And some aloo-bhujiya too if she had the time for this delicacy among tying up the hold-alls and arranging gifts for those we were going to visit. Some in the family find the mandatory Saturday khichdi dinner too bland? Just plonk a portion of achaar on the cribber’s plate and watch him gobble up the khichdi with alacrity. An honoured guest at home (eg son-in-law) had to be welcomed with tons of sweets or commonly haluwa. Lest he got sick of so much of mithaas, you served generous quantities of achaar on the side to balance the hyper-sweetness. Pregnant daughter/daughter-in-law at home longing for something spicy to eat? No worries, help is at hand. Just serve her a some of the achaar at home. Sattu ka paratha (makuni in Bhojpuri) to be spiced up? No problem, just pour into the sattu mix a portion of the spiced up oil from one of the achaar containers at home. All this may sounds casual, but I have seen with my own eyes as a kid the painstaking process of preparing achaar at home. It requires hours of preparation, days of curing, months of saving it up for years of consumption. Sounds confusing? Let me explain this to you. Aam ka achaar was the most popular one in a Bihari household, and I believe it still is. Pitaji would shop for the right mangoes at just the right price. This would be brought home in a big jhola. He would have a look of glee on his face as if saying what a great bargain he had made. Mai would get down to cutting the little mangoes- soaked in water for a while- in just the right way, dexterously removing the “stalky” end of the fruit which if left behind may spoil the eventual product. it would be dried in the blazing sun for a whole day. These would be spread on a clean cotton sari or a dhoti on the terrace or the bagichaa and left to dry under the blazing sun for the entire day. The children in the household were deputed to keep an eye on the mango pieces and to shoo away any adventurous birds which might want to sample the fruit or simply sit upon the spread. Once dried, the inner white chhilka (the whitish thing encasing the non-existing guthli) would be removed as that could spoil the eventual end-product. This mass of cut and cleaned mango pieces was coated with haldi and salt and kept away overnight. Then a propriety mix of dried spices would be roasted and ground. Yellow sarson, haldi, lal mirch, ajwain, mangrail, methi, dhaniya, etc etc. This dry mix would be added to mango pieces in a shallow, large dish (paraat in Bhojpuri) and copious amount of oil would be added. Mustard oil was mandatory. How else would the achaar get its distinctive flavour! This well-spiced and well-oiled mass was placed into a large glass jar with a wide mouth. Hindi-speaking India calls this jar a martbaan, in Bhojpuri we call it a boiyyaam. I still remember those vessels with a glass lid with a neat orb perched on top serving as the handle. The jar would be placed in the sun for some fifteen consecutive days, placed outside in the morning and returned to the shelf in the kitchen by sunset. The jar would be gently shaken once in a while to ensure that the oil was adequately distributed across the jar. After fifteen days the achaar was ready to consume. The spice and oil ensured that it could last even for three years. Just some oil needed to be added once in a while and some occasional sunning of the achaar as well. While mango achaar was the most popular achaar in Bhojpuri household there were some other common ones as well. The lethal looking, but extremely tasty laal mirch achaar, anwala, katahal, amda (distinct from anwala) and nimbu ka achaar. Kids were often asked to help in preparing the nimbu for the pickling process. The nimbu had to rid of its outer surface- probably to enable the spice to permeate inside- and this was a laborious process. It had to be scraped against a stone or other such hard and rough surface. All hands on board for this activity! I knew I will miss India when I took a job outside India. I was leaving my family behind, so I would indeed miss them. I would miss the home food, though thankfully I have an Indian domestic help who cooks for me. So roti, sabzi is not an issue. But the problem is the taste! And I do miss intensely achaar and chutney. Chutney of the mooli-dhaniya-tamatar variety. And when life seems tough and monotonous, the dinner too insipid, eating alone a chore, I reach out for one of the factory-made achaar bottles I always keep. They are not quite the home-made stuff, but what the hell, their mere presence on my dinner plate brings back oodles of joy in life, and tons of taste in the meal! This entry was posted on Tuesday, July 31st, 2012 at 2:01 pm and is filed under Uncategorized. You can follow any responses to this entry through the RSS 2.0 feed. You can leave a response, or trackback from your own site. 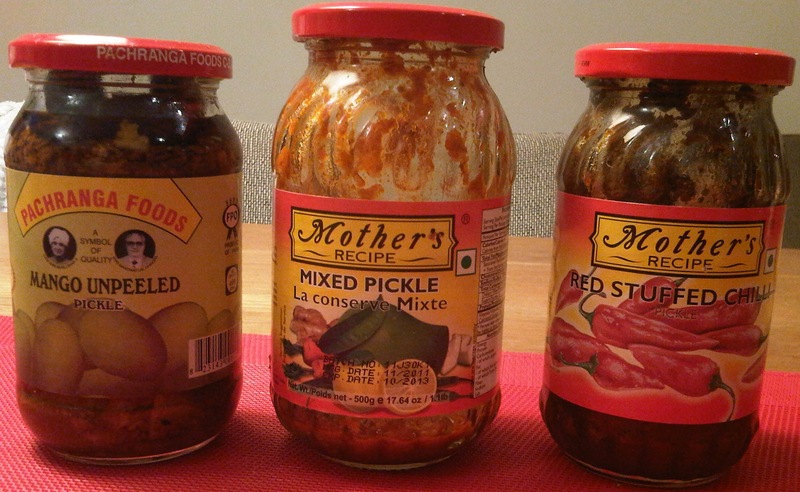 9 Responses to Aah the joys of Achaar! u make my mouth water . I shall now rush and buy bottles and bottles of ACHAAR !!! I wish they sold bottled Bihari achaar! Maybe there is a great business idea here!! you are right, Bhaiya, that achar and chutney are still integral part of our foods. But I don’t like these preservative loaded achars (including the brand given above in your picture). in childhood, my dadi and maai used to make achar without any preservative and believe me you can use them round a year ot two wihtout any degradation in taste. I agree with you, totally. However in this foreign land, any taste of India is most welcome- even preservative loaded! How I long for Kathal ka achar made the Bihari way !!!!! The sarson ka tel,salt, haldi powder, and vinegar are the necessary and sufficient preservatives in any achar. The other ingredients are for flavour. Sir, you have explained entire recipe of Aachar. I still remember Nimbu (Zamira Nimbu) rubbing on Jhawa (Veriety of Brick). I made some Kathal ka achar, here in Bahrain. Came out quite well. Thanks to raw kathal from Sri Lanka, Sarson tel from Pakistan, and advise by email from my sisters.